Hi there. So on my last post, I left off when Donnough went ashore to get our trainees and the rest of our crew. We got pretty lucky with that because the wind just happened to lay down to a nice 15 knots or so for the entire time he was ferrying people back and forth, AND while we craned our zodiac back onto the deck-house for safe-keeping (there is a large “derrick” on the fore-mast which is used to lift heavy objects on and off board, including man-overboards). The weather really is interesting around here…you just can’t count on it being the same literally from one minute to the next. Since I didn't get any good shots of us anchoring, the beautiful photos in this post are from my Second-mate Richard, taken from the zodiac on a calm day while we were at sea. At some point after our shore-party got back on board, with the winds getting back up into the mid-high twenties, the Captain decided to put down a second anchor. On the water, one encounters all kinds of potentially dangerous situations, and choosing from the wide variety of possible courses of action is the artful skill developed by captains over a lifetime. Each response has its benefits and risks, and the key is to know those well, and understand how it will all play out. When you’re expecting a blow, you might decide to head back to the dock if you’re close enough to home; you might also choose to “heave to” if you’re out in the open ocean and you have no other option. If you’re nearby to a harbor of safe refuge, or even just an island that you can put between you and the blow, you might drop an anchor there. The risk of anchoring in a protected cove, of course, is that if you have a wind-shift, you could find yourself precariously hanging off your anchor on a lee shore. In this case, you might want to put out a second anchor, to guard against the possibility of dragging anchor onto the shore and wrecking your boat on the rocks. 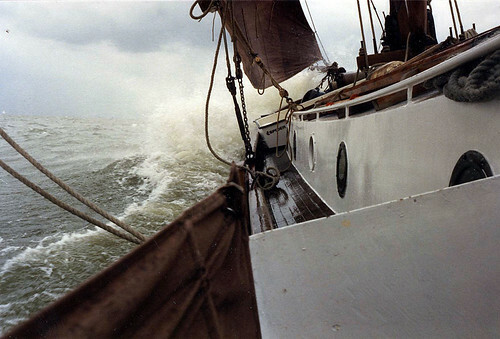 However, the risk THERE is that if the winds are shifting frequently, your two anchor chains could get twisted, leaving you in a difficult situation when you try to retrieve them. Lots of factors to consider! I just found a fantastic article on gcaptain.com discussing the benefits of using two anchors in rough weather…worth the read! If you look at the water by the bow on the port side, you can see the swell we were experiencing. Doesn't look like much, but we could really feel it! 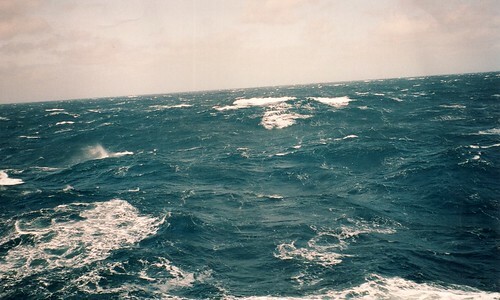 The whole voyage, our first mate Donnough had been telling me that we needed to be south at Recherche Bay by Saturday night because a gale from the north-west had been forecast to come in sometime Sunday morning. Saturday night came, and in the dark we felt our way into the little cove with the help of a spotlight and some lookouts. I happened to be on watch at the wheel as we came in, and Donnough stood by and let me steer us in! Taking commands here can be difficult for me because of the accent; I often have to ask for a repeat. Being called to by the Captain was a bit nerve-wracking, since in a small harbor with reefs (shoals) things can get tight. “One turn starboard!…Amidships!…One spoke to port!” I was really concentrating on listening, trying to will my ears to understand. In addition, I’m not the most experienced helmsman, and I’m still getting used to the way Winde steers. At one point the Captain came back to the wheel to ask my heading, which was a degree or two off the ordered course. She looked at me and said “It is absolutely imperative that you not deviate from the course at all. The waters are full of reefs here.” So, what do you do in this situation? You quickly learn to steer perfectly! Not a degree of deviation. Luckily, I brought us safely to our anchoring spot and for the rest of the night and the next day, we sat at anchor, keeping entertained with games on board and a shore visit, while we waited for the weather to come in. By early afternoon, with the kids still ashore playing cricket, it did…but from the south, putting us on a lee-shore! Most of the crew was aboard when the winds started, and we all sort of wandered about as it picked up, sitting in the deck-house for a while, then going outside, casually checking the anchor chain, the wind-gauge, then making small-talk, then checking our shore party out through the binoculars. It’s interesting watching how different people react to the uncertain potential for a big blow: some like to keep busy, others just sit still. We were all in the deck-house, the captain, first and second mates, the cook and I, when our shore party called for pick-up. With the winds whipping outside, Donnough, with his slurry of Irish and Australian accents, offered to our second mate, Richard, to go pick up the party. “That would be nice, Donnough, if you don’t mind,” Richard responded. Just then a big gust shifted the boat, and we all paused for a beat like prairie dogs alert to an intruder. Our view from the anchorage...sometimes a squall comes through in brilliant sunshine. I just finished reading this fantastic sailing adventure book by a Brit named Miles Smeeton. He and his wife were heroes of WWI and after the war, like many people, missed the excitement and adventurous lifestyle they’d grown accustomed to. After attempting a new start on a farm in Canada, they bought a yacht and began sailing around the world. 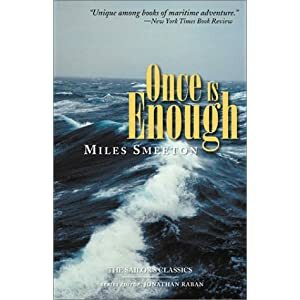 “Once is Enough” is Miles’ account of the attempt by him and his wife, Beryl, to round Cape Horn west to east in their 46′ wooden yacht, Tzu Hang. He and Beryl, along with their friend and ship’s carpenter John, survived an almost unbelievable knock-down, dismasting and swamping of Tzu Hang. After completely repairing and refitting the destroyed ketch, Miles and Beryl made a second attempt. I found my way to this book while reading “A Voyage for Madmen” about the 1969 race to be the first non-stop solo circumnavigator (also a great read). This is a beautifully composed memoir of an exceptional journey through the South Pacific. What more can I say without sounding cliche? If you are addicted to sailing adventure stories like me, you’ve got to hunt this one down. Give a man — or a girl for that matter — a horse he can ride, and sooner or late he, or she, will want to ride further and faster and to jump higher. Let a man climb one mountain and he must find another until he seeks the snows. It is the same with a ship…Capes and seas, like mountains, “are there,” to round and to cross; and adventure, even when not in search of knowledge and without scientific aim, is good for its own sake. I am staring through the platter-shaped pane at the space below. 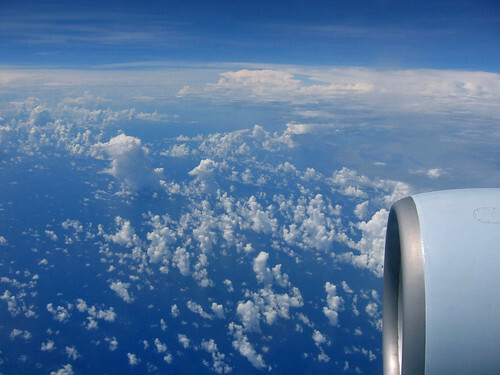 There are clouds, and then between clouds, little white specks against the deep blue Atlantic. They do not move. The ocean, like time, stands still when observed from a distance. Are these truly waves I see? From so far away? I watch keenly for some minutes, like a child silently examining a stranger, to verify that they are not, in fact, small clouds. No, they are too evenly scattered, too distant and grounded. There must be a good bit of wind down there, to produce waves large enough for me to see. I track what must be a single crest for a minute. Its movement is undetectable against the sea. An hour later there are no more waves. The great blue expanse below is calm; its storm has passed, or we have passed its storm. In my beginning with boats, when I worked on the Isaac Evans up in Maine, I used to stare out at the water most days, with the sun spread across my shoulders and bouncing off the waves, knowing that I was discovering something great. I would think to myself, my God, there are millions of people in their homes right at this very minute, sitting on couches, watching programs on television that mostly bore them. Civilization sounded a little less cocksure in those moments. But now the sea has disappeared for me, under a velvet layer of cloud and twilight. Behind us the sun is setting, just five hours after I saw it rise: the strange time-warp produced by eastward travel during winter. The last of its light reaches up from the horizon, tinting the sky pink, a touch of shimmer across her eyelids before she disappears into the dark.